We previously announced that Walt Disney World would be opening a new attraction known as Mickey & Minnie’s Runaway Railway. This attraction will be located in Disney’s Hollywood Studios within the Chinese Theater. This is the same location where The Great Movie Ride used to be located until it was closed to make room for this new attraction to be developed. 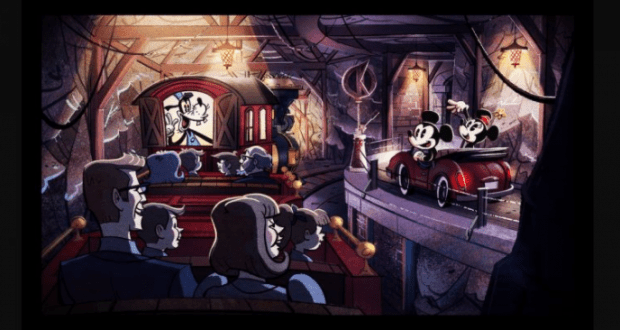 The new Mickey & Minnie’s Runaway Railway attraction is currently set to open at Disney’s Hollywood Studios in 2019. The new attraction will be immersive for guests as they get to enter into the cartoon world. You can always count on catchy music from Disney, too! The attraction will be begin with a premiere of a new cartoon short with Mickey and Minnie preparing for a picnic. They will drive alongside a train where Goofy is the engineer on the locomotive. Then in true Disney magic, you get to enter into the movie and go on a wild ride on Goofy’s train. Disney is partnering with Disney Television Animation so that the characters and storyline are completely authentic and good representation. This new image that was released is the latest in information on the new attraction, and we definitely can’t wait to learn more. Keep checking back with us on the latest information related to Mickey & Minnie’s Runaway Railway. We will be posting details as soon as we learn more. Who else is as excited about this as we are?